Die-hard fans of Final Fantasy like myself had been waiting for this a long, long time and our wish was finally realised – ditching Singapore and come perform live in Malaysia for a change. Distant Worlds: music from Final Fantasy is the official world-tour symphony concert that performs the music from the extremely popular role-playing video game franchise and on the 16th of November 2012, they finally had their inevitable, highly demanded debut in Malaysia. I almost couldn’t get my hands on any ticket at all ’cause all three shows were labelled “sold out” until the last minute release of the presumably cancelled bookings. Even then, there were only less than 20 tickets available, which were all purchased hours after I bought mine online. 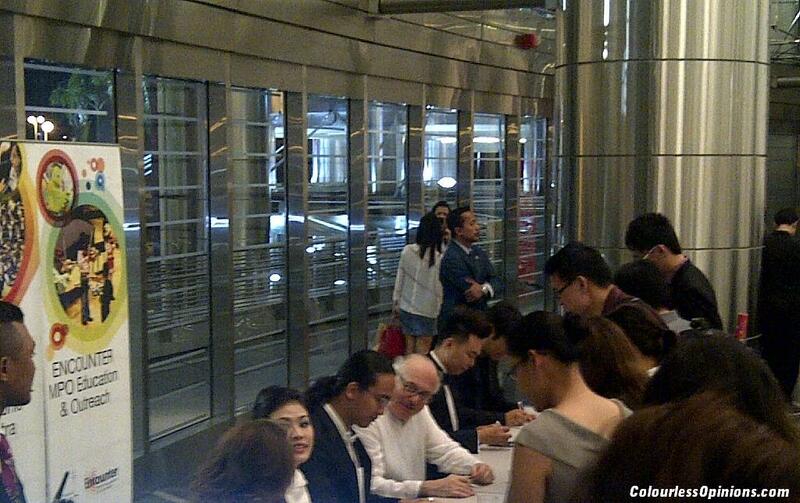 It was the first time I went into the Dewan Filharmonik Petronas (KLCC, Kuala Lumpur) and damn, it was strict. All attendees had to be in semi-formal clothing and are not allowed to use their phones or any other electronic devices at all in the hall. I only managed to snap a shot of the stage before the staffs came telling me to switch off my mobile. Hence the lack of images of the concert here. Nobuo Uematsu , the composer for almost all the Final Fantasy music, did not make the trip but the concert featured the one and only conductor for the music – Arnie Roth, the Grammy-winning music director who has worked with Uematsu and Square Enix for years. Roth directed our country’s very own Malaysian Philharmonic Orchestra (MPO), Dithyrambic Singers (choir), Stephanie Van Driesen (soprano), Az Samad (guitar), Ho Chi Mei (soprano), James Long Cai Hunt (tenor) and Mak Chi Hoe (bass vocals) to a long and loud standing ovation on the first show here last night. Besides the little unsynchronised singing by the choir on the first number, Prelude, and the guitar volume that didn’t blend with the orchestra for Dear Friends and Vamo’ alla Flamenco, I thought everything else sounded close to perfection. I was completely captivated and had goosebumps throughout the entire concert even when songs unfamiliar to me were performed. Every piece performed projected so much emotion, and to the fans, we see a great tale behind every song. When I hear the music, I recall the story of that title, I feel how I felt when I was playing that scene, and I remember the experience when I was young. My least favourite piece was The Man with the Machine Gun but only because it’s the theme of my least favourite parts in Final Fantasy VIII. I guess they needed something more upbeat to balance out the set list. I would’ve been delighted if they performed Fisherman’s Horizon or Eyes on Me instead (which are also on their master repertoire list). I would’ve been even more pleased if there was at least a piece from Final Fantasy Tactics. We then got to catch a glimpse of how the Chocobo theme’s gonna sound like in the upcoming relaunch of Final Fantasy XIV: A Realm Reborn when Roth decided to merge it with Swing de Chocobo for the Chocobo Medley. My favourite of the night was definitely the 12-minute piece, Opera: Maria and Darco. The vocals were so impressive and mesmerising with the brilliantly orchestrated music, I was almost in tears. It’s amazing how such a small part in the plot of Final Fantasy VI could have such a mad piece of music. Close to the end of the show, they received a standing ovation so strong that left Roth no choice but to award the audience with two encore songs, which is apparently rare of them to do so. The visuals of the games shown on the screen played a huge role as well, adding in even more nostalgic effect for those who hasn’t played the games since they were very young. This was what Video Games Live (VGL) was crucially missing when they play FF’s songs at their shows (rights weren’t given to VGL to use the visuals, I suppose). I got the crappy-looking ticket (seriously, DFP needs to redesign their tickets!) autographed by Roth and the other main performers after the show. 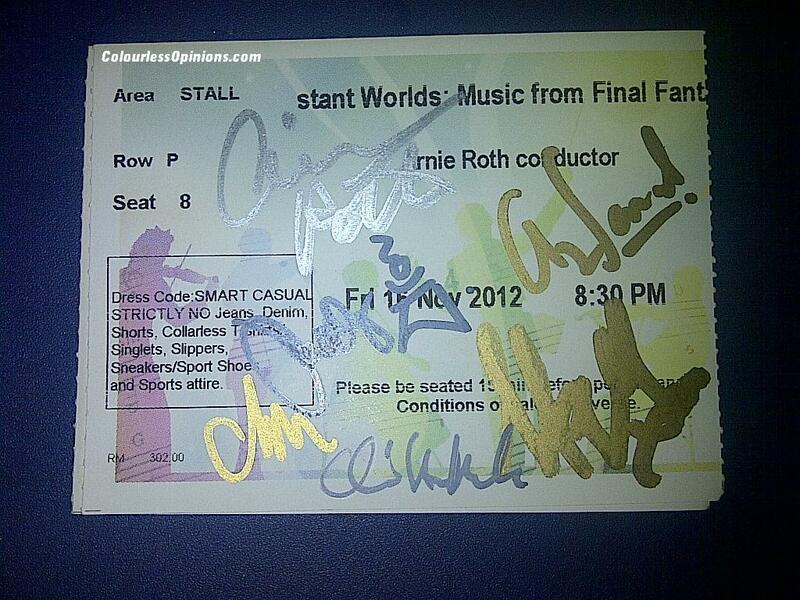 The only missing signature here is Uematsu’s. The man sorta composed the soundtrack of my childhood so I really hope to have the honour to shake his hand one day. Hopefully the next time Distant Worlds come to Malaysia again, he could make an appearance. I love orchestras, they always have a classy feel to me. @wawaKyoko Well at least it's not in Singapore instead of Malaysia again! @TheJessicaT One Winged Angel is clearly listed on setlist above -__-"
It was a pity that some of the other beautiful songs weren't played. If they do come back again, I'm hoping for new songs and them being beautifully played as well. Yeah. I agree with the guitarist. I went on the Saturday show, slightly disappointed by how the guitarist handled Vamo' Alla Flamenco since I was a huge fan of FFIX. But the rest was awesome. FFXII wasn't on the showlist and was sorta let down too D: And some of the good themes… Maybe *wishful thinking* those are saved for next year. Envious of how you got their signatures. 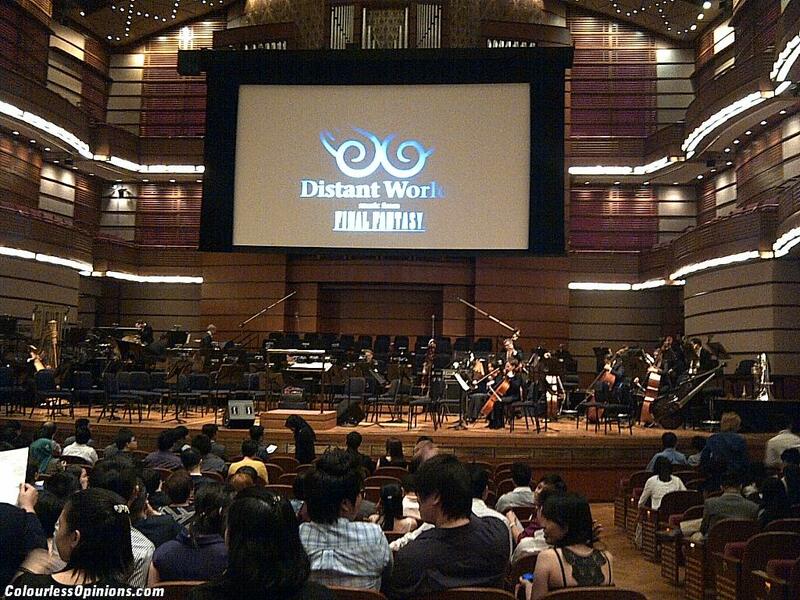 ;_; I do hope Distant Worlds visits Malaysia soon! Thanks for the great insights though! I heard good reviews for this. People leaving feeling gooooooooood!